We had some warmer weather on Friday, so I headed out to spend an hour at Joe English Reservation in Amherst. My goal? To explore the trail we hiked in the dark about three weeks ago. Have I mentioned that I love snowshoeing? For me, the beauty of it is in its simplicity. It's easy to learn. The equipment is inexpensive. You can do it close to home, even if you only have a short time to spare. And it's a fun way to explore the landscape in winter! I didn't see any wildlife, except for birds. 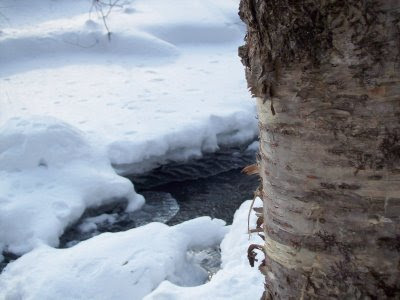 But I noticed lots of paper birch trees (like the one shown above) and I saw what I believe are snowshoe hare tracks. What do you think? It's probably hard to tell from this photo, but the tracks definitely showed the large hind-foot characteristic of a snowshoe hare. Peabody Mill Environmental Center (on-site) offers well-marked trails, simple maps for loan or more detailed maps for purchase, and even personal GPS systems. The 600-acre Joe English property has a varied terrain through the woods that includes small brooks and streams, with a couple of interesting footbridges. 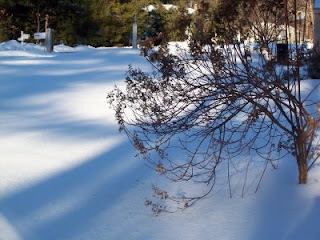 There are several places in our immediate area that rent snowshoes and offer trails. Why not try one out and tell us what you think? Better yet, if you know of a place that I haven't mentioned, please write and share with the rest of us so I can add it to the list. I haven't seen this snowshoe hare, but I've been wondering about these beautiful animals ever since we saw their tracks while snowshoeing at the Joe English Preservation Area in Amherst. I've sinced learned that while snowshoe hares have plenty of predators (including fox, bobcat, fisher, weasel, owls, and red-tailed hawks, to name a few) -- the very fact that they survive at all is partly due to their remarkable "natural engineering," and of course, their ability to "reproduce like rabbits." 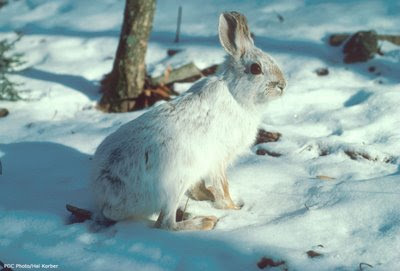 Snowshoe hares are lean, with very large hind feet -- all the better for them to move quickly on top of the snow. But if their hind feet were any bigger, according to one source, they would sink in the snow, making them easy prey. So it's good that their feet have stopped growing! Even better is that their fur changes from brown to white in the winter, a process that takes about a month. But if they turn white too soon, they stand out against our brown, November landscape; and if they stay brown too late, they stand out against the snow. In other words, if the timing of their molt isn't just right, they might as well be wearing hunter's orange! Some scientists believe that snowshoe hares try to compensate for this molting dilemma by heading for the higher elevations in the fall so their coats will change sooner. Once they're white and we've had snowfall in the lower elevations, they come back down to their preferred habitat near swamps. Amazing, isn't it? Remember the line Renee Zellweger says to Tom Cruise in the 1996 movie Jerry Maguire: "You had me at hello?" That's how I felt about snowshoeing. Within the first ten minutes on the trail, I knew it was something I could get into. That's a pretty amazing statement for me, considering I hate cold weather and up until now, I've never met a winter sport I like. It may be a stretch to call snowshoeing a sport; it's as simple as walking. At least, it was simple in the way we approached it--on flat terrain using a well-packed trail. I even decided to take along ski poles for added balance, although they really weren't necessary. I'm sure it's a whole different story to snowshoe up a mountain or to be the first to break through fresh, deep snow. Our first excursion on snowshoes was last Saturday night during a full moon hike at Peabody Mill Environmental Center in Amherst. The Center is adjacent to the nearly 600-acre Joe English Reservation, a wooded area named for a Native American who befriended the white man and was eventually killed for betraying his fellow Indians. Peabody Mill offers full moon and new moon hikes year round and they also rent snowshoes during their normal daytime hours of operation. Vicky, our naturalist guide, was enthusiastic and knowledgeable, even if Mother Nature didn't quite cooperate. The moon and stars stayed hidden behind a veil of clouds during our one-hour trek. 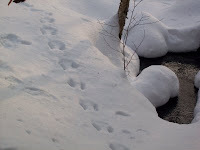 We never saw any animals or heard so much as a peep from them, but we did see lots of animal tracks, including snowshoe hare, weasel, porcupine and mice and we learned some interesting facts about animal behavior. Vicky surmised the wildlife might have already hunkered down against the snowstorm moving in later than night. So it was dark and quiet, but oh so peaceful. I couldn't help thinking about Robert Frost's poem, Stopping by Woods on a Snowy Evening. One line kept running through my head as we crunched along on the trail: "The woods are lovely, dark, and deep. But I have promises to keep. And miles to go before I sleep. And miles to go before I sleep." After our mini-adventure, I made a promise to myself to keep trying new outdoor activities, no matter the weather. There's so much natural beauty all around us, if we only stop long enough to enjoy it. 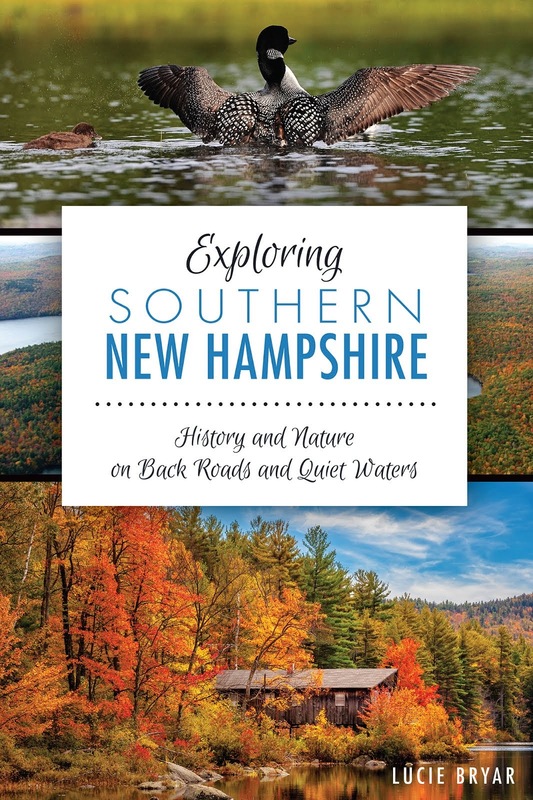 Things to Know Before You Go: There are many places in New Hampshire offering snow shoe rentals and trails. I'll try to write more on that in coming weeks. For now, check out Peabody Mill's website for more information. Their next new moon hike is January 24th at 7 pm and the next full moon hike is February 7th at 7 p.m. Reservations are required. Kayaking and Snow Shoeing on the Same Day? It's early January in New Hampshire and currently 21 degrees outside -- too soon to be thinking about kayaking, right? Well, not for the enthusiastic group of paddlers who belong to the East Hampstead Kayaking Meet Up Group. They're already planning a spring get-together for March 29th. It's billed as an "afternoon of fun with a guest speaker, local kayak retailers, door prizes and raffles." I haven't met any of these folks yet, but I have joined the group and hope to take part in some of their outings next season. To learn more, check out their webpage at http://kayaking.meetup.com/174/about/. And now for snow shoeing. Pardon my pun, but this seems to be the "hot" new winter sport. As the saying goes, "If you can walk, you can snowshoe." Well, I haven't tried it yet, but I'll have a chance to do that tomorrow. I signed us up for a full-moon hike at Peabody Mill Environmental Center in Amherst, NH -- snow shoes optional. May I take a moment to whine? I don't know what I was thinking! I hate the cold and Accuweather is predicting temps in the single digits. I guess the upside is that our new-fallen snow should be beautiful by the light of the full moon. I'm going with my longstanding resolution to keep trying new things. New year...new adventures! I hope you'll check back in a few days for my report.